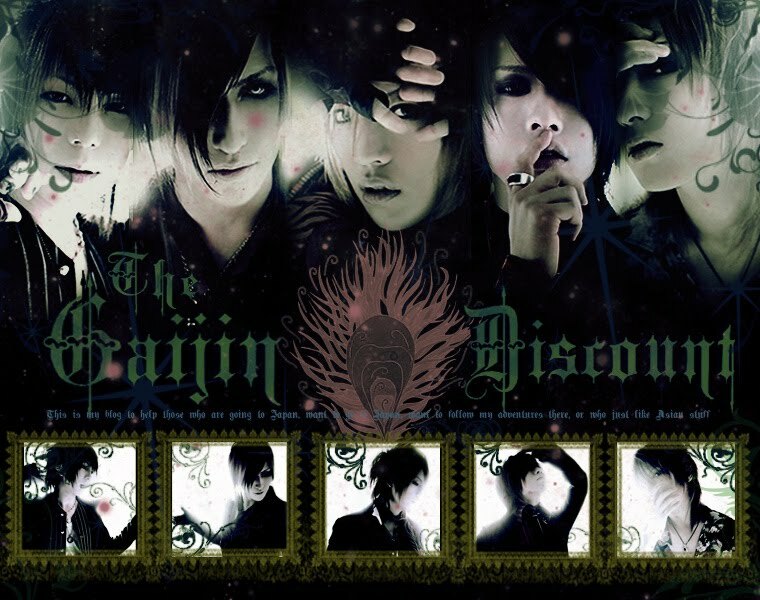 The Gaijin Discount: V-Rock Fest '09!!! So, first of all, I apologize for not posting in a while. I keep meaning to do it, but then I get busy with teh tons of books my professors are giving me, or trying to get yet more money issues worked out over here. Btw, if you bring a money order, have someone else fill it ALL out from your US (or wherever) address to you Japanese address. If you fill this info out, they won't cash you international postal money order. So, that's good to know. I also learned how to buy tickets from the ticket machine at the Lawson's convenience store. There was a step by step guide I found on one of their sites that shows you exactly what to push, though it's all in Japanese. If you're coming over here and need help, just PM me. Anywho, so yes, today was the first day of my 2 day Visual Kei Rock Festival. Very exiting. I started out small, watching a small indie band called Toon Factory, then SuG on one of the minor stages in a different hall, then quickly perused what little merchandise they had (I could only see stuff that said VROCK FEST on it, not band merchandise), and then I went into the main hall where they have to huge stages set up, side by side. I got in the fairly empty area for Kra, and watched the other stage diagonally while Penicillin rocked out in that old rock star fashion. Then Kra came on and played about 6 songs/30 min., playing harder songs that I thought they would. After that, I fought my way over to the stage on the right, where hours from then, I would get to watch alice nine. What surprised me is that people didn't really pack in ahead of time, and they aren't all trying to weasel their way up front. Everyone at the concert today just came up to the back of the mass and was content where they were, and didn't really get close to each other either. Because the standing room area things mostly empties out after every performance, I managed to get almost to the front bar, but as time drew closer, I depated on trying to get through the special line that lets you go up to the very front of the stage, and after about 10 min. of debating, I bit the bullet and went over to the guy with the Staff shirt on, and he let me through to the crowd at the front of the stage. And then Alice Nine came out. And they were amazing. There was a slight Microphone mishap at the beginning, but Hiroto (sporting a bleached hair style I don't love), took centerstage while the Crew worked on show, and then everything went smooth. They looked amazing, just like they do in the pictures (so did SuG); just gorgeous. Shou was in a sparkly red shirt with scarf covered by a sparkly black jacket; Nao was in Red, but never really got any limelight; Tora was looking spiffy in dark gray pants and a dark greenish/grayish jacket; Saga was in a black shirt, some weird Hammer black pants and a white leather jacket with his hair teased out a mile, and Hiroto was in hot pink pants and a white vest (I think). They first played The Beautiful Name, then went into Rainbows, then some song which I know, but the name of which I've forgotten, then their old classic, Shunkashutou, then GGG (can't remember the full title off hand; three words starting with G), which was the head banging song, then finished with something Shichigatsu Nanoka (again, can't remember all of the long title off hand), which we got to sing along with. They were amazing live, as good as on the CD, and Shou was all smiles, and everything was great. After watching them, I filed back into the regular standing area to wait for Abingdon Boys School (watched Plastic Tree diagonally), and then finally ABS came on, and much to my surprise, they put on the best show of all (minus A9, of course), and it was PACKED with people, both sides brimming more than they had for anyone else, which I hadn't expected at all. Their stage set up was cute; follwoing the english theme, the stand/step thing for TM (the vocalist), was fashioned like a Mini Cooper, complete with working headlights that were part of the light show. TM turned out to be a good MC too, quite charming and friendly, and he spoke in the most formal language, which was strange I thought. I knew most of their songs, but by the end of their set (they'd started late and ran long), I was about ready to go. Starving, thirsty, with a headache and a backache, all I wanted to do was go home, but I pushed myself to go outside where, according to a map, there were more goods to be had. When I'd seen earlier in the day that there was no band merchandise, suffice it to say, I was a bit disappointed, but as I trudged out from the oven-like, smoky sauna (the air was a hazy gray inside), and into the rainy outdoors, I found a line of stalls, all with a band name on the top, where you could buy their stuff. I, of course, opted for alice nine, and bought a hoodie, a phone strap and a water bottle thing, all vastly overpriced. I debated over getting an Abingdon Boys School towel or something, but eventually realized I'd spent too much on the alice nine stuff already, so I didn't get anything else. Well, that's the news for now. Tomorrow is round two and another really long day because they've put the bands I most want to see as first and last, so there's no skipping out on Marilyn Manson tomorrow. Well, again, sorry it's taken so long for me to post, and sorry I don't have any pics (they won't let you take them inside). Talk to you again soon! WOW! What an amazing time! I'm so happy you have this blog to tell us all about it. Good luck on day 2! Fighto! V-Rock Fest '09 Day 2!! !